"This hearty soup is as filling as it is comforting. 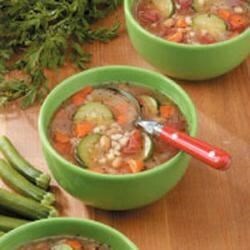 Full of zucchini, barley, tomatoes and carrots, it's one recipe that people always ask me for." In a large saucepan or Dutch oven, saute the onion, garlic, basil and dill in oil until onion is tender. Add the broth, water, carrots and barley. Bring to a boil. Reduce heat; cover and simmer for 30 minutes. Add the pork and beans, zucchini, salt and pepper. Cover and simmer 10-15 minutes longer or until vegetables and barley are tender. Just before serving, stir in tomatoes and vinegar; heat through. Nutritional Analysis: 1-1/2 cups equals 218 calories, 6 g fat (1 g saturated fat), 5 mg cholesterol, 1,003 mg sodium, 36 g carbohydrate, 9 g fiber, 9 g protein. Diabetic Exchanges: 2 starch, 1 vegetable, 1 fat.